Update Feb. 12, 2015: The window for self-nominating for the 2016 election of delegates in time to be included in the Annual Conference workbook will close Feb. 15. Florida Conference Connection will report on nominees after the deadline. LAKELAND -- Members interested in representing the Florida Conference as delegates to the General Conference and Southeastern Jurisdictional Conference in 2016 should get ready to make their bid beginning Sept. 1. Nine clergy and nine lay delegates will be elected for each of those conferences at the Florida Annual Conference event in June 2015 at Bethune-Cookman University in Daytona Beach. Seven alternates from each category also will be chosen. 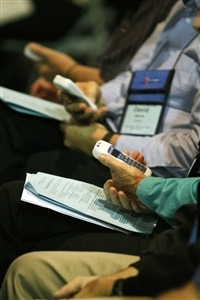 Voters at Annual Conference 2015 will use electronic devices to elect delegates. 2011 file photo. The nomination window for those who want their information included in the Annual Conference 2015 workbook will remain open until Feb. 15, 2015, according to rules adopted at this year’s Annual Conference. New for this election, people will also be given a few hours to throw their hat in the ring at the start of Annual Conference 2015. To run for election, each candidate will be required to submit an essay and fill out a questionnaire that seeks basic demographic information and a few details, such as church and district membership. Candidates will also be asked to submit a photo in jpeg format. The photo is optional but advisable, said Rev. Ken Minton, Florida Conference secretary. “The intent is to help people get to know each other,” he said. Nomination applications will be available on the Annual Conference 2015 web page and on the Conference Secretary/Conference Business web page, starting Monday, Sept. 1. Eligibility requirements and other details are available on pages 69-72 of the Annual Conference 2014 workbook. Minton said changes to the nomination period were made to enhance opportunities for new people to seek election. The fall-winter nomination period was extended, and the opportunity to self-nominate at the beginning of Annual Conference 2015 was added. Deadlines for preparing materials for Annual Conference attendees dictate the traditional nomination period, he said. To accommodate people who can’t meet that nomination deadline, the conference Elections Procedures Committee recommended a window for last-minute nominations on the day of the laity and clergy sessions at the upcoming Annual Conference. Aspiring clergy and lay delegates will be given three hours that morning to submit their materials. For those who meet eligibility requirements, copies of the information will be printed and posted in prominent locations at the conference before the elections begin. The new rules continue efforts begun a few election cycles ago to increase opportunities for people to serve as delegates, Minton said. Self-nomination, begun some years ago for aspiring lay delegates, has been particularly effective for those who wish to serve but don’t have broad-based name recognition, he said. As a result, “I think we’ve gotten quite a bit more participation on the laity side,” Minton said, adding that recent elections have attracted more young adults in particular. Self-nomination was extended to clergy beginning with the 2007 election. The 2016 General Conference will be held May 10-20, 2016, in Portland, Ore. The Southeastern Jurisdictional Conference is set to begin July 13, 2016. In recent years, the Florida Conference has elected 11 clergy and 11 lay delegates to serve at the general and jurisdictional conferences, where major policy decisions are made for the church. Last year, the Commission on the General Conference voted to reduce the number of delegates for the church as a whole from nearly 1,000 to about 850. That led to a reduction in the number of delegates to be elected in Florida. The number of delegates per annual conference is calculated based on the requirement for one lay and one clergy delegate for each annual conference, with additional delegates assigned according to a formula that considers the total clergy and lay membership per conference. For questions not covered in the workbook or for clarification, contact Rev. Elizabeth Gardner at beth.gardner@flumc.org.